As Vodafone gear up for 5G, recently announcing the 19 cities in the UK where it will launch its 5G service before the end of the year, EE continue to lead download and upload speeds across the country. Our latest mobile experience report for the UK also shows O2 improving latency to overtake Vodafone, as all operators improve network stability. Across the UK, EE continue to perform best for both download and upload speeds on 4G, averaging speeds of 26.56 Mbps and 12.28 Mbps respectively. EE lead average download speeds in England and Scotland whilst Vodafone perform best in Wales, averaging 25.36 Mbps on 4G. Three demonstrated the fastest average 3G download speeds across the UK, averaging 7.06 Mbps compared with second place EE at 5.76 Mbps. Three also overtook O2 for 3G and 4G upload speeds. As with upload and download speeds, O2 also perform best for latency on 4G, averaging a delay of just 16.1 ms. On 3G however they placed fourth, with an average delay jumping to 64.8 ms behind O2, Vodafone and Three respectively. On 4G, O2 have improved their average latency result and overtaken Vodafone to move into second place compared with our November Market Snapshot report from 2018. All operators also show improved network stability on 4G since the end of last year, with EE and Vodafone performing best with the average lowest jitter and packet loss results from January. 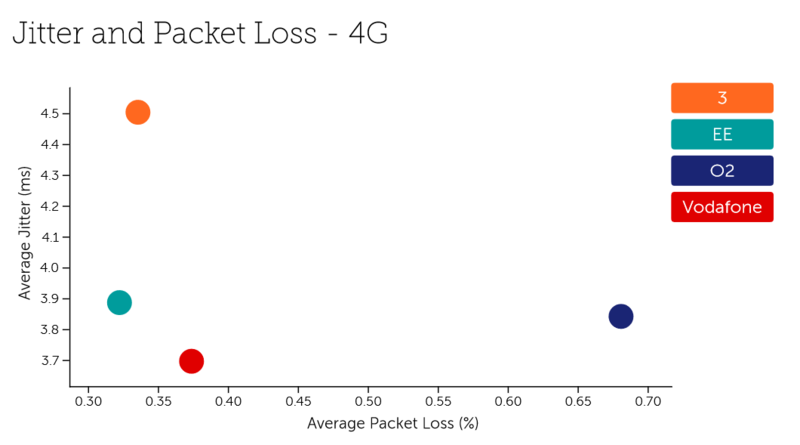 O2 performed well for jitter but is let down by its relatively high packet loss results. 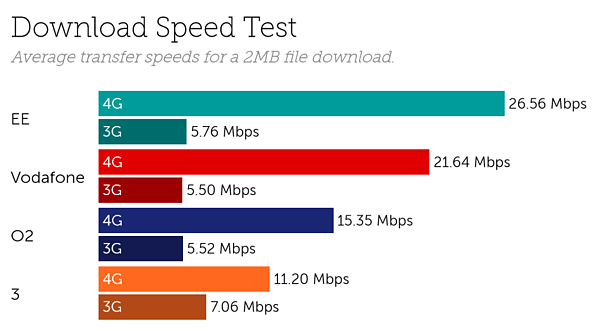 Conversely, Three performed well for packet loss, but is let down by its high jitter results. Our findings for the UK are based on 39.1 billion network quality measurements including 7.91 million speed tests in January. Our latest complimentary Mobile Experience Report is available to download from the Tutela Insights portal.